The annual Galisteo Studio Tour has been offering a unique inside experience for 29 years. 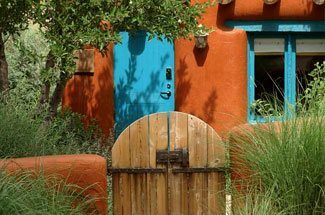 Nestled in the beautiful Galisteo Basin is a historical village outside of Santa Fe with a diverse population of artists. At once, you will see why artists have been drawn to this gorgeous location. The landscape features stunning natural elements such as high desert landscapes, enchanted forests, golden sunlight, and awe-inspiring sunsets. These enthralling scenes have been recreated in a variety of media. Photography, paintings, ceramic art, bronze sculpture, hand-crafted traditional arts, jewelry, pottery, and more can be found at the Galisteo Studio Tour. The Galisteo Studio Tour features a variety of artists in the small adobe village of Galisteo, just south of Santa Fe in the Galisteo Basin. The yearly event occurs each October and opens their studios to the public for a chance to view, appreciate, and potentially purchase a taste of the local art scene. This year’s event will take place on October 15 and 16. Along with the art, you will get to absorb the gorgeous historic architecture of the small village. This includes old adobe buildings, homes, and ruins. The Galisteo Studio Tour is dog-friendly and easily walkable, making it one of the best you can experience in Northern New Mexico. Along with some incredible and inspirational artwork, you can discover delicious food at the Galisteo Studio Tour. Special food stops along the tour serve traditional New Mexican fare along with contemporary fusion dishes for your tasting pleasure. For now, the two featured stops will be La Cocina de Mela and the Street Food Institute. La Cocina de Mela will be serving traditional New Mexican plates, featuring Mela’s famous red chile. The Street Food Institute offers a variety of exotic flavors and local specialties, alike. These include barbecue, a vegetarian feast, and a taco bar, depending on the catering choice. At least 23 artists will be participating in this year’s Galisteo Studio Tour. Within that group, you will discover quite a spectrum. While Janet Pfeiffer offers encaustic paintings (made with hot wax), Arthur Lynn creates hand-forged knives using traditional centuries-old methods. While Sam Sloan captures black and white photographs of Southwestern landscapes, Elizabeth Rose molds abstract bronze and ceramic sculptures. 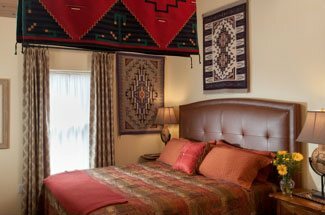 During your weekend Galisteo Studio Tour, stay with us at Four Kachinas. At our Santa Fe bed and breakfast, we offer the best of both worlds. You will be close to restaurants and downtown activities while also able to retreat into our quiet courtyard for some rest and relaxation. We offer delicious gourmet breakfasts each morning along with charming Southwestern decor. We are an ideal destination for a variety of activities, from a romantic getaway to a nature exploration. If you’re looking for more cultural events and activities to participate in during your vacation, download our free vacation guide! Our complimentary vacation guide will also provide you with a variety of wonderful locations to visit around Santa Fe. See you soon!